Hyderabad, Apr 08: Vijay Deverakonda's upcoming film Dear Comrade has already created a lot of buzz with its very interesting teaser. Now the first single from the much-awaited movie is out and it is an instant winner. The makers have launched a soothing, mellifluous song as the first single. "Nee Neeli Kannulloni Akasame..." is a song that will instantly strike a chord with music lovers and will be played in a loop. Justin Prabhakaran's soothing music is ably supported by singer Goutham Bharadwaj. The song reminds us of Rahman's compositions and sets high expectations on the remaining songs from the album. 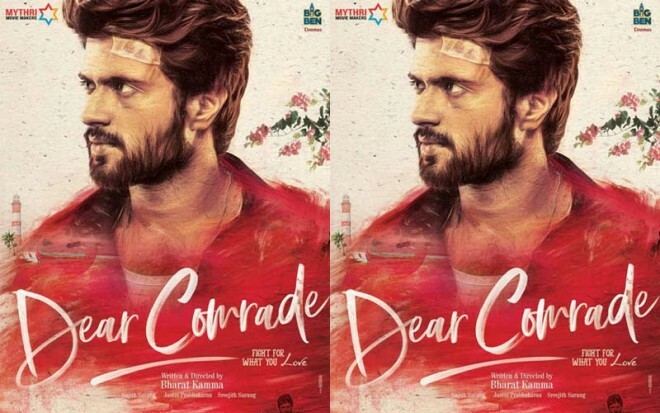 'Dear Comrade' has been ticking all the right boxes to set its expectation meter on a very high level. The film has Geetha Govindam's pair Vijay and Rashmika romancing for the second time. This time the romance will be intense going by the teaser. Bharat Kamma is the director for the film bankrolled by Mythri Movie Makers.